During a short walk through Dublin city centre earlier this week on my way to a board meeting in Christ Church Cathedral, I was impressed that as part of the 1916 centenary commemorations the Bank of Ireland in College Green has been decorated with a large banner celebrating the lives of Henry Grattan, Daniel O’Connell, Charles Steward Parnell and John Redmond. These four patriots represent a strong, continuous tradition of Irish parliamentary and democratic action, and it seem so appropriate that during these commemorations these leading democrats should be celebrated on the façade of the building that once housed the Irish Parliament, ‘Grattan’s Parliament,’ until the Act of Union was passed in 1800. Of course, he conveniently forgets that Sinn Féin did take part in the 1916, that in 1916 the Sinn Féin leader Arthur Griffith was a monarchist who advocated a dual monarchy for Britain and Ireland, and that the IRA was not formed until long after the Easter Rising. It is not just Easter, but Saint Patrick’s Day too that have been hijacked this year, so that they have been robbed of their religious significance and turned into celebrations that are in danger of supporting a very narrow view of nationalism that writes out the stories of those who eschewed violence and advocated both a democratic and a more inclusive set of values for Ireland. This was no day to go into the city centre. Instead, two of us decided this afternoon to celebrate this “green and pleasant land” by going up into the Dublin and Wicklow mountains, through Cruagh and Killakee, across the Feather Bed and down into the little valley of Glencree, with the Glencree Centre for Reconciliation and the German War Cemetery by the banks of the River Dargle. When I was more active in the Irish Campaign for Nuclear Disarmament (CND) in the late 1970s and the early 1980s, Glencree was a regular venue for residential committee meetings and for training workshops in nonviolent direct action. But the centre has a more militaristic background. We approached it this afternoon along a military road built over 200 years ago to hunt down the United Irish rebels who were holding out in the Wicklow Mountains after the 1798 Rising. The army built a barracks at Glencree in 1806, but this was vacated after the defeat of Napoleon in 1815. In 1858, the buildings were converted into Saint Kevin’s, a reformatory school run by the Oblates of Mary Immaculate. During World War I, Glencree held German prisoners of war. The school reopened after the war, but finally closed in 1940. During World War II, Glencree was used as a detention centre for German pilots who crashed in Ireland and for German agents captured trying to plan anti-British activities with IRA collaborators. After World War II, the Irish Red Cross and the French Sisters of Charity ran Operation Shamrock, caring for German and Polish war orphans in Glencree until 1950. The Glencree Centre for Peace and Reconciliation was set up in 1974 and continues to run programmes on violence, war and conflict and to provide training in mediation and conflict resolution. We had coffee and a snack with friends in the Armoury Café, where the conversation included recollections of days of CND activism and nonviolent protests. From there, we crossed the road to the German War Cemetery (Deutscher Soldatenfriedhof). There are 134 graves, mainly of German air force, army and navy personnel: 53 are identified, 28 are unknown, and six are World War I prisoners of war. But 46 graves tell the tragic story of German civilian detainees who were being shipped from Britain to Canada for internment. Their ship, the SS Arandora Star, was torpedoed by a German U-boat off Tory Island, Co Donegal, in July 1940. One grave is that of Dr Hermann Görtz, a German spy who died by suicide after World War II, fearing he was going to be handed over to the Soviet Union to face trial for war crimes. In the 1930s, Görtz had been jailed for four years in Maidstone for espionage, and was then deported to Germany prior to the outbreak of World War II. In 1940, he parachuted into Ballivor, Co Meath, as part of an espionage mission to gather information. He arrived with his uniform, his World War I medals, and papers marking out selected military targets in Ireland. Görtz moved in with a former IRA leader Jim O’Donovan. As ‘Agent V-Held,’ O’Donovan had visited Germany three times in 1939 on behalf of the IRA, and Görtz was sent to Ireland to act as a liaison officer with the IRA and to enlist IRA support for a German invasion of Britain. However, Görtz decided that the IRA was too unreliable. Dressed in his Luftwaffe uniform, he walked to Dublin, where he stayed in a number of “safe houses” in, Templeogue, Glenageary, Dún Laoghaire, Dalkey, Rathmines and Shankill, Co Dublin. He also stayed briefly in Brittas Bay, and in Laragh Castle, Glendalough, Co Wicklow, Fenit, Co Kerry and Mount Nugent, Co Cavan. For 19 months, he remained at large. His spying operations against Ireland and Britain were aided by Anthony Deery of Dundalk, an IRA wireless operator who transmitted his coded messages to Nazi Germany, and Charlie McGuinness of the IRA who helped him to move around Ireland. When police raided the Clontarf home of another IRA activist Stephen Carroll Held, in May 1940, they found Görtz’s parachute, papers, war medals, and documents outlining his widespread spying operations, as well as detailed plans of ‘Plan Kathleen,’ an IRA plan to invade Northern Ireland with the military support of Nazi Germany. Görtz went into hiding but was arrested as yet another IRA member, Pearse Paul Kelly, was visiting him in his hiding place in Dublin in November 1941. He was released from jail in August 1946, but when he was rearrested the following year and served with a deportation order he took a phial of cyanide and died in Mercer’s Hospital. He was buried in a Dublin cemetery, but his body was transferred to the German Military Cemetery in Glencree in 1974. The cemetery in Glencree is a tranquil place today. Many of the graves are marked simply in German with epitaphs such as “Two German Soldiers,” or “Two German Airmen.” Many of those who are named were only in their 20s when they died. In this afternoon’s sunshine, with the babbling sound of the river and the small waterfall behind me, this was a place of peace and calm. But it was also a reminder that the victims of war are so often young people, and a reminder of the follies and evils of nationalism, whether it is the extreme nationalism of Nazis in Germany or the IRA in Ireland. We must continue to value our democracy and to celebrate those who chose the path of democratic and nonviolent action. The past week has shown how once again it’s fashionable to be Irish in France. The Wild Geese are no longer poor refugees but affluent aristocrats. But as many an Irish family knows, it was not always so. In 1651, Patrick Comerford sailed for France as a refugee from Waterford. Twice, before the ship reached Brittany, it was plundered by pirates, and two of his nephews, Paul Carew and John Fitzgerald, died of plague. Within a year, Patrick had died too, and following his death on March 10th, 1652, he was interred in the episcopal vault in Nantes Cathedral. When the vault was opened again in 1659 for the burial of Robert Barry, Bishop of Cork, according to a contemporary account, “the body of Dr Comerford was found quite incorrupt”. Comerford was born in Waterford in 1586 into a family that had supplied mayors and sheriffs of the city for generations. Three of his Comerford cousins, Richard, James and Thomas, were Jesuits, while a fourth, the Rev Thomas Comerford, was Rector of The Rower in south Co Kilkenny – a form of family ecumenism that was not uncommon at the time, but had little appeal to Patrick Comerford in later life. After schooling in Kilkenny and Waterford, he left for France at the age of 17 and studied theology in Bordeaux, and later at Lisbon and Coimbra, before receiving his doctorate in Florence. While he was a young priest in Spain, his brother was captured by pirates and taken to Morocco. Comerford collected the ransom among his friends, and headed off to purchase his brother's freedom. But by the time he reached Spain he heard good news and bad news: his brother had been released, but on landing in Spain had died of the plague. The young Augustinian used the ransom to procure the release of 100 slaves held by the Moors. For a time, Patrick was a professor of theology in both Terceiro and Brussels, but he soon moved to Rome, where another cousin and former schoolmate, the Franciscan Luke Wad ding, had founded St Isidore’s and held the grand title of Qualificator of the Holy Office. The Diocese of Waterford and Lismore had been without a Roman Catholic bishop since 1578, but following a petition from the clergy of the diocese in 1629, Patrick Comerford was appointed bishop, probably through the influence of Luke Wadding. He was consecrated by Cardinal Bentivoglio in the Church of St Sylvester on the Quirinal in Rome on March 18th, 1629, and sailed for Waterford soon after. Copies of an address of congratulations presented by the staff and of the infant Irish College, founded the previous year, still survive, in the National Library and in the Franciscan Archives in Dublin. Back in Ireland, Comerford held strong ecclesiastical influence throughout the south east, controlling many church appointments in his own diocese and in the neighbouring counties of Kilkenny and Wexford. He was involved in the effort to re-establish monastic foundations abolished during the Reformation, and held the office of Prior of Kells, Co Kilkenny, although it was no longer an Augustinian foundation. Patrick Everard, a Waterford Cistercian who had been appointed Abbot of Dunbrody by Pope Urban VIII, was given that appointment by Bishop Comerford. However, it is unlikely that Everard managed to take physical possession of Dunbrody – it remained in the hands of the Etchingham family, and Everard served out his days as parish priest of Ballyhack and died of the plague at Duncannon. As bishop of Waterford and Lismore, Comerford took part in the episcopal conferences and synods called in Kilkenny in support of the Confederation and presided over by David Rot he, Bishop of Ossory. When Waterford fell to Cromwell, Comerford set sail for France, never to return. His diocese remained vacant for 18 years after his death. Patrick Comerford appears to have been a well-dressed bishop. In 1637, an Order in Council required the Mayor of Waterford to restore to the Church of Ireland dean and chapter of Christ Church Cathedral “certain copes and vestments, which he had in his custody” – he appears to have been holding them for Comerford’s use. These included five copes and a set including a chasuble, dalmatic and tunicle with sides and maniples – enough to turn out any High Church bishop in style. The copes and vestments were never returned, however, and Comerford’s successor John Brenan (1671-1693), complained unfairly that the ecclesiastical ornaments of the diocese had been taken away to France by Comerford in 1651. The church finery disappeared for generations, but were literally unearthed when Bishop Richard Chenevix ordered the demolition of Christ Church so the city could be graced with a new Church of Ireland cathedral. During demolition work between 1774 and 1779, the missing vestments were discovered in the crypt. 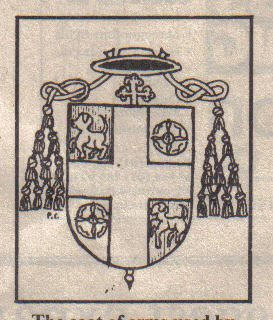 The low church Chenevix was on such good terms with his Roman Catholic counterpart that he presented them to Bishop William Egan, and they can now be seen in the National Museum. Over a century after Patrick Comerford’s death, a new spirit of ecumenism was in the air in Waterford. Egan was pleased with the vestments, and he also delighted in the new cathedral commissioned by Chenevix. In fact, he was so pleased, he also asked the same architect, John Roberts (1714-1796), to design him a new cathedral in Barron Strand Street, now the oldest Roman Catholic cathedral in Ireland. All this ecumenical co-operation might have made Patrick Comerford’s “quite incorrupt body” turn in his episcopal vault. After all, he had been known in his lifetime as malleus haereticus, the “hammer of the heretics”. But if he was less than ecumenical by today's standards, we might credit him with some part in ensuring a wider celebration of Saint Patrick’s Day on March 17th. He chose March 18th as the day for his consecration as a bishop, and it may have been through his influence that Luke Wadding had the feast of Saint Patrick inserted in the Roman Calendar for March 17th and made a feast of the Universal Church.